Jesus was in the Temple at daybreak, teaching the people who came to hear him. He sat down and began to teach them. While he was doing so the Scribes and the Pharisees brought a woman along who had been caught committing adultery. Note there is no mention of the man even though the Law was quite explicit that both should suffer the death penalty. (Leviticus 20:10 and Deuteronomy 22:22.) They made the woman stand in full view of everybody. How humiliating to be exposed in such a shameful way. The Scribes and Pharisees asked Jesus what ought to be done in this, case stating that according to the Law of Moses those caught in the act of adultery were to be stoned to death. They knew that under the Roman occupation the Jewish people did not have the authority to execute people, so they had set a trap for Jesus. To answer their question Jesus must propose an action contrary either to the Law of Moses or contrary to Roman Law. This, however, was a trap in which Jesus refused to be caught. He bent down and began to write something in the dust. Then he raised his head and said, “If there is anyone among you who is without sin, let him cast the first stone.” He then continued his writing. One by one, the accusers slunk away “beginning with the eldest”, leaving only the woman and Jesus. Once more Jesus looked up and asked her where her accusers had gone. There is no one left to accuse her or to initiate the horrible death by stoning that would have been the penalty. Jesus then said: “Neither do I condemn you: go and do not sin again.” What a relief it must have been for the woman to experience the compassionate and loving forgiveness of One who is full of mercy and compassion. 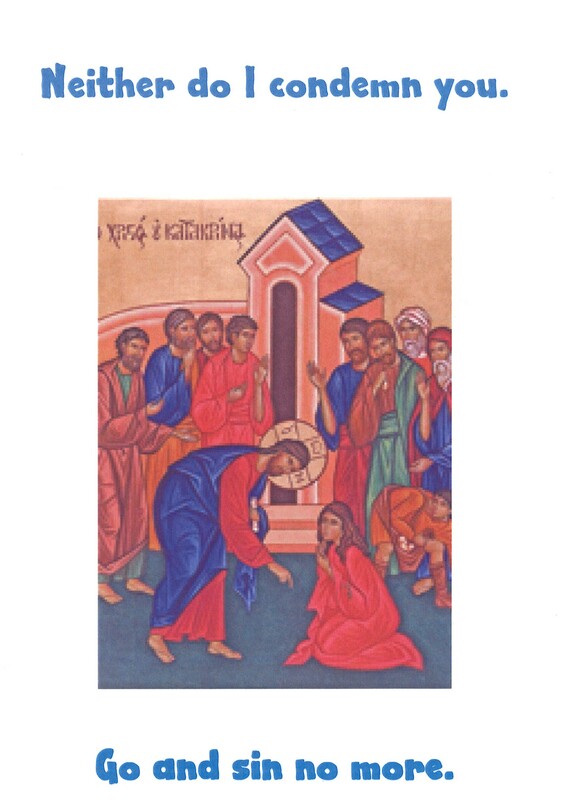 Jesus mercifully restored the dignity of this abused, battered and humiliated woman. She was most likely on the verge of despair and was then given hope. This story captures the absolute epitome of compassion. Jesus did not scold her, humiliate her or break her spirit. He had empathy for her and forgave her. How grateful she must have been to Jesus who saved her life. We too are shown that very same kindness always. It is said that the most beautiful eyes are those that see everything through love and compassion. A few questions may be helpful. 1. When someone wrongs you, how do you treat them? 2. Let’s ask ourselves why we feel so condemnatory and judgemental? 3. When was the last experience of healing in your life which brought about change?